Ten insane, irreverent, wacky and wonderful golf songs. Any golfer who is a fan of Ray Stevens or Tom T. Hall will enjoy this collection of originals. A published songwriter, experienced singer and guitar player, and an avid but overly challenged hacker of the little white ball. 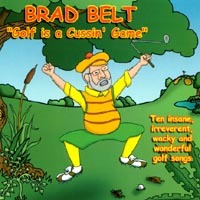 Brad has combined his twin passions - one for golf and the other for music - into a unique musical album. Few people have captured the spirit and humor of the game of golf in the special way that Brad has. The power of the game to: override all else (Golf Scramble-itis), to beget creative language (Golf Is A Cussin' Game), stand between man and wife (I Don't Go Golfin' With My Wife), to teach lessons of life (Never Up, Never In), to humble and humiliate (Double Boget Blues), the lists goes on. . .
Any golfer will treasure this wacky and wonderful tribute. This is music that literally everyone from all ages and orientations can enjoy. Obviously, if you are an avid golfer, "Golf Is A Cussin' Game" will be music that you can "relate" to better. But, overall, it is about quirks of human nature and personality... about the humorous similarities and differences that we politely do not generally admit to. Outside of the Inside antics of Golf itself, this music is about "us" (in whatever situation we find ourselves). That is one reason this CD is so "Feel Good" Funny. I play this CD often... not only for the humor... but because it lifts my spirits. It's a "pick me upper". I highly recommend this CD by Brad Belt… and am anxious to hear his next offerings. great cd - very funny!!!!!! funny cd, i used it for my slide show when my hubby and his brother went golfing.